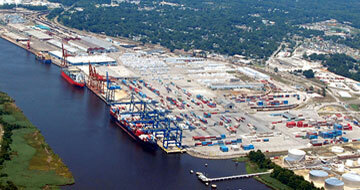 The Port of Wilmington is strategically located on the U.S. East Coast. Owned and operated by the North Carolina State Ports Authority, the Port of Wilmington offers terminal facilities serving container, bulk and breakbulk operations. Wilmington is one of the few South Atlantic ports with readily available berths and storage areas for containers and cargo. An aggressive capital program has positioned the Port of Wilmington in a new class of service to the maritime transportation Industry. A 42-foot navigational channel offers customers additional vessel capacity. Readily available modern transit and warehouse facilities, new state-of-the-art Panamax container cranes and support equipment, and the latest in cargo management technology provide a broad platform for supporting international trade to the fast-growing Southeast U.S. market. Recent and ongoing improvement to regional and national highway networks make surface transportation supporting the Port of Wilmington superior to neighboring ports. CSX Transportation provides daily service for boxcar, tanker and general cargo services. The Port of Wilmington has ample capacity to support today’s cargo volumes and continues to invest in expanding the facility to meet projected growth in international trade, with a major expansion project currently under way.